Pasir Panjang is an area located at the south-western part of Singapore, District 05. The residential area in Pasir Panjang is generally private homes located along Pasir Panjang Road. This area is well-known for its port and wholesale industry facilities as well as Singapore's most fashionable address. 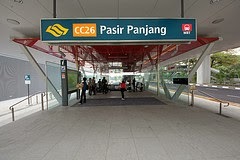 Nearest MRT station is Pasir Panjang MRT station. Pasir Panjang is well accessible via nearby road and expressway such as Pasir Panjang Road, West Coast Highway and Ayer Rajah Expressway (AYE). Shopping Centre nearby include Queensway Shopping Centre, Anchorpoint Shopping Centre and Clementi Shopping Centre. Prominent School close to Pasir Panjang include River Valley High School, Blangah Rise Primary School, Fairfield Methodist School (Primary), Bukit Merah Secondary School, CHIJ Saint Theresa's Convent and many more.